There is nothing more Spanish than the jamón serrano. This country ham is a national treasure shared in Spain by all walks of life. Serrano is cured for at least a year, it has a much deeper flavor firmer texture than Italian prosciutto. Serrano is more than a delicacy in Spain; it is a normal part of every family’s life. Serrano is a flavorful, natural ham, cured in the country air. This extended curing transforms the ham, imparting a deep flavor and aroma. This lengthy curing also means it has much less fat and has a much firmer bite than Italian prosciutto. We use a "reserve" serrano that has been aged for 18 months in the Spanish mountain air. We are currently featuring this jamon as our charcuterie dish, a little manchengo and membrillio(quince paste) and your instantly transported to Spain. One of the reasons for posting a bit on the Jamon that I love so much is the recent change in the laws,About 2 years ago, Iberico hams, the most gourmet of Spanish jamones, were first sold in the United States. They arrived with black hooves on—a symbol of Spanish hospitality and a guarantee of Iberico authenticity. 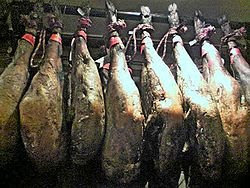 Now after a USDA ruling effective January 2009, all hams will arrive without the black hoof. And on top of that, the ruling added a punitive 100% tariff on all bone-in Iberico hams, which will double the price of any delivered after March 2009. A $1,400 ham will now set you back $2,800. Iberico hams start with pigs who gorge themselves on acorns in the Spanish forest meadows, giving them a deep olive like and nutty flavor. Unlike the pink pig, the Iberico's hooves are normally black, hence the "pata negra." 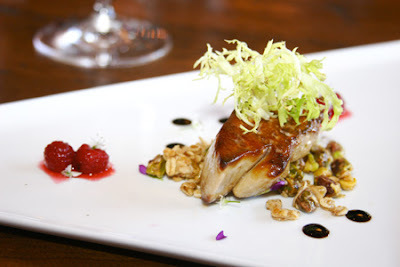 Its a shame that this delicacy will no longer be something that is reasonably priced ($1400 is well worth every penny)and even if you do spend the $2800, the excitement of seeing the black hoof is gone. Why does the govt. get involved with these type of things? Aren't there much bigger fish to fry these days?